Aaron Hernandez, Former Patriots Player Convicted Of Murder, Found Hanged In Prison Cell : The Two-Way The former New England Patriots tight end was serving a life sentence in prison for killing the boyfriend of his fiancee's sister. He was found by corrections officers early Wednesday. Former New England Patriots tight end Aaron Hernandez looks at the jury after his double murder acquittal last week. Hernandez, who was already serving a life sentence witout parole for murder, hanged himself and was pronounced dead at a Massachusetts hospital early Wednesday, according to officials. Former New England Patriots tight end Aaron Hernandez was found hanged in his prison cell early Wednesday. "Mr. Hernandez hanged himself utilizing a bed sheet that he attached to his cell window," Christopher M. Fallon of the Massachusetts Department of Corrections said in a statement obtained by NPR member station WBUR. "Mr. Hernandez also attempted to block his door from the inside by jamming the door with various items." Hernandez was found by corrections officers in his single cell in general population at about 3:05 a.m., Fallon said. After the officers attempted lifesaving techniques, he was transported to a nearby hospital where he was pronounced dead at 4:07 a.m.
Massachusetts State Police are investigating, Fallon added. Hernandez was serving a life sentence without parole at the Souza Baranowski Correctional Center in Shirley, Mass., for killing Odin Lloyd, the boyfriend of his fiancee's sister, in 2013. A jury unanimously convicted him of first-degree murder in 2015, as The Two-Way reported. 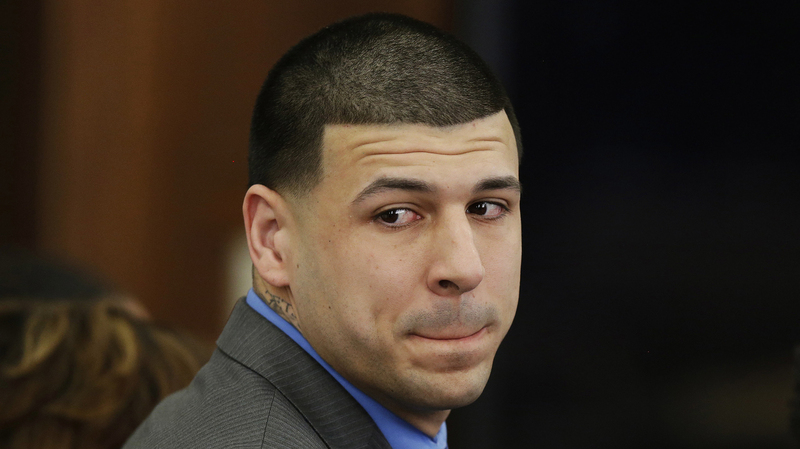 Last Friday, Hernandez was acquitted of separate murder charges in the 2012 killing of two men, Daniel de Abreu and Safiro Furtado, outside a Boston nightclub. But the jury found him guilty of illegal weapons possession and sentenced him to four to five years in prison. "The former tight end for the New England Patriots wept quietly as the verdicts were read in Boston. A few moments later, he looked back at his fiancée and nodded somberly as relatives of the victims sobbed loudly. A defense attorney hugged him." He died the same day that President Trump is hosting the Super Bowl champion New England Patriots at an event at the White House. "Team spokesman Stacey James said the Patriots were aware of the reports of Aaron's death but didn't anticipate the club commenting Wednesday," according to The Associated Press.